Allow *.axs *.axb to show up in favorites?? The ability to to set range and step-size of custom object Parameters (as you can with Attributes) would be great. I know it's possible to post-process parameter values in the object itself, but It would be nice not to have to do that, and also (more importantly), it would be great if the values on the control matched the values used internally (though I'm aware this is only an issue within the Patcher itself, but still...). What are the use-cases for step-size? What 'd be the expected behavior when such parameter is mapped to a midi CC? One "difficult case" is BPM controls, people often use a "round" bpm number, below 40 does not make much sense but an upper limit of 40+127 (when increments are mapped to midi CC increments) would be 167 bpm, too low as an upper limit. Avoiding parameter re-computations in dsp code is certainly a goal, and frequently used, but currently not very flexible or documented well. Also UI (unit) values are not flexible in object configuration. An object that has the option to show tekst instead of just values. I guess the argument there is that since the Axolotl doesn't have a screen, such a feature is only really of use within the Patcher application. That's not the case with Reaktor, since a Reaktor Ensemble or Instrument can have whatever GUI you choose, so the need for a wide variety of control interfaces is stronger. Thanks for your thoughtful reply, johannes. In both cases, it would be useful to have the controls actually show integer values in a particular range (2 to 128, and 0 to 128, respectively). It just feels weird to me to have some arbitrary number displayed on the UI element in this case. BPM, as you mention, is another case in point. Oh, my bad. I didn't realise that. Is it possible to set a default, too? I think the only sensible way to do this, from a user's point of view, is for the whole range of the CC (0-127) to map to the whole range of the control (whatever it is). I realise this will mean some conversion will have to be carried out. Yes true. But I still think it would be a nice object to have. I use Axoloti with the patcher running most of the time. I think a lot of people do. I havent really used mine in stand alone mode yet, always connected to a computer. So for me it would be very valuable. How about some kind of indication of a percentage of Axoloti processor resources each object will use? Not so easy, this can depend on context (leaving certain inlets/outlets unconnected can lower the load), and object settings (for example polyphony). sram is still free, thats should be easier.. This could be an object that just sends the index of the selected item as an integer from its outlet. I guess typically, you'd connect one of these to a Multiplexer or Demultiplexer object. How about Nord Modular-style 'Morph Groups' that could control a number of different parameters at the same time, with per-parameter ranges. This may already be possible. If so, I'd love to know how. 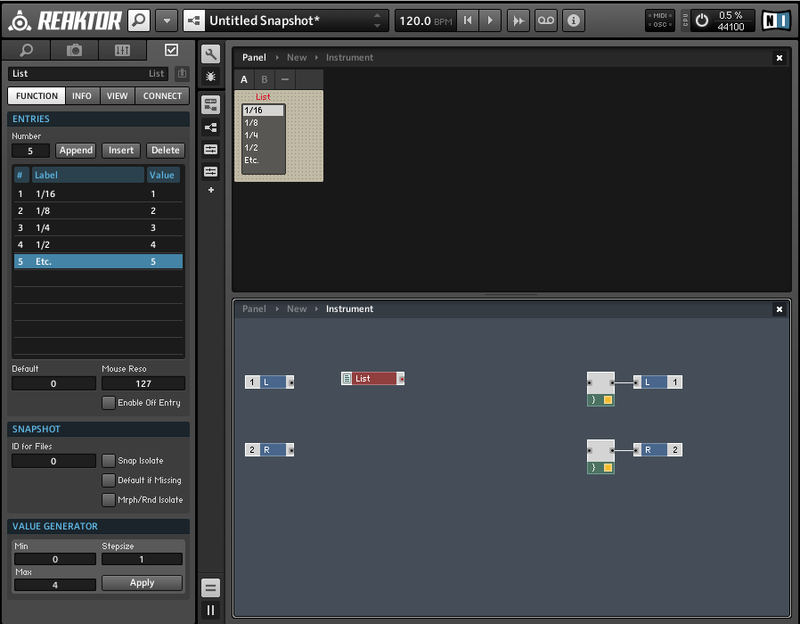 More randomization, the one thing I loved from the Nord Modular was patch mutations. Allowing you discover sounds in your own patches you might otherwise never make, maybe to make it easy you could exclude knobs that are already in a preset? similar to how the Nord lets you exclude selected objects from mutation. This way you can keep things like gain from randomizing to a high number and shredding your ears. Mutation and Randomisation could just operate in the patcher, so there wouldn't be any hardware overhead for the Axoloti Core. You'd Randomise or Mutate, then save to a preset, I guess.